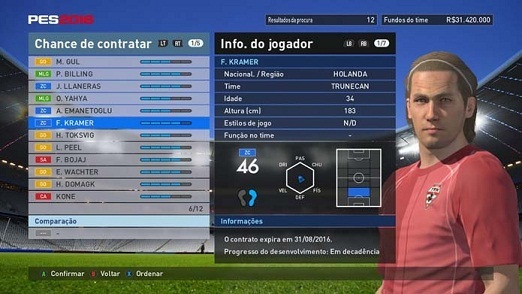 The Konami’s soccer simulation PES 2016 brings all the major leagues and the world's football players. In less expressive championships, you can find a variety of far less impressive players, with attributes that come to surprise negatively. Check out the list of 10 worst and lowest rated players available in the Konami’s simulator. The Ivorian kicker had the misfortune to lead the list of the worst players in the Konami game. Experienced, Kone impressed by the complete lack of precision in shooting, that puts you in difficult situations. The goalkeeper of 26 years calls attention to the technical difficulties, including the most basic attributes for a goalkeeper. Even in development, it is hard to trust the Austrian to defend the goal. Goalkeepers are considered the most underrated players in football, but not with that excuse the Finnish Keeper can justify his lack of quality in place. The 32-year-old is slow, he has few reflexes and poor ball out. Bojaj is still young, but, relying on the current assessment in Pro Evolution Soccer 2016 is complicated recommend striker generic "West Yorkshire Town" for any team. Another player thankless position, goalkeeper Peel is one of those that don’t pass safety in the game matches. Although high, the athlete from Slovenia is clumsy and without technique, and these characteristics complicate the time for more challenging defenses. The Danish Toksvig is another representative of the goalkeepers to suffer from terrible attributes in PES 2016. The player has the same problems as companions, and there is still the disadvantage of being down to the position. First defender of the list, Kramer is experienced, but no chop to pursue minimally fast opponents and falls short on the technical side. The Turkish curious name to commands respect by topping physical, but with the rolling ball must not offer the slightest resistance in competition against top players, or even the median. Half of the traditional Al Sadd brings together a bunch of bad indexes, which does not justify the escalation of the player in his team. Slow, little technical and lousy finisher, Yahya is the nightmare of any center field. Tenth worse player in Pro Evolution Soccer 2016, Venezuelan J. Llaneras unfortunately does not have much to celebrate. The rare technical difficulty quarterback is not ideal even for the reservation of your team and must end forgotten in the game.